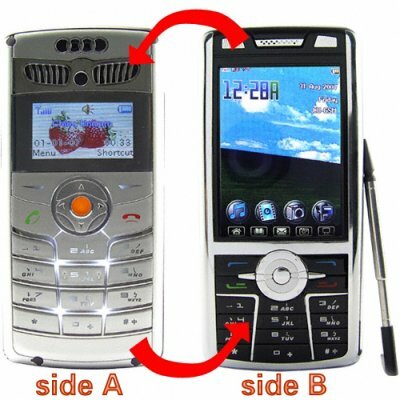 Successfully Added Dual Core, Two Sided, Dual SIM Cell Phone to your Shopping Cart. If you are thinking about buying a second cell phone, or if you are living with the hassle of carry two already, this phone is an inexpensive and convenient alternative. This phone has everything you need for business and personal use. YES - this mobile phone is like having two phones in one! Because of its dual core build, this mobilephone can handle two calls at once. So with two GSM SIM cards inserted into this model, you actually have two phone numbers which people can reach you at. If you can never be unavailable, whether you are a CEO, on call doctor, or mob lawyer, then this is the phone for you! Another cutting edge mobile phone innovation brought to you by Chinavasion, China's leading Electronic Wholesaler. Dual screen mobile phone with individual control, like two phones in one! Advanced Bluetooth features including remote control and A2DP + AVRCP. NOTE: You can receive two calls simultaneously on this phone but you cannot link them in a conference configuration - the callers will not be able to hear each other. NOTE: This product is compatible with GSM at the frequencies of 900MHz and 1800MHz. Please check with your local provider if you are unsure of your local band requirement. SIM Card Modes: Both SIM are always "live"